Busy week ahead for data as we begin to get an early read on February data. Since early 2016, incoming data has told the story of improving global growth. 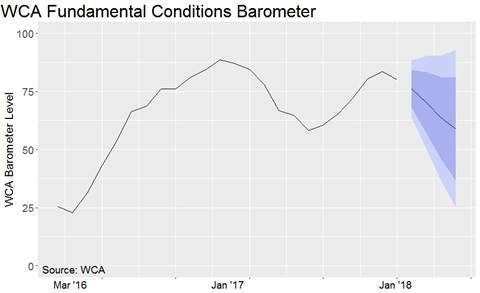 Today, our WCA Fundamental Conditions Barometer (below) remains above 50 supports a bullish case. 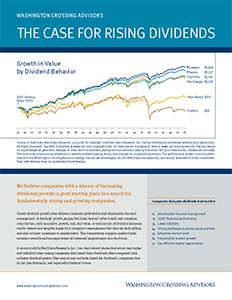 We attribute the 30% rise in U.S. stock values to improving earnings, which in turn, reflect better growth. Further augmenting the earnings outlook, and the run-up in stock values, was last year’s tax cut. That cut will begin to filter into reported profits in the months ahead, and into withholding tables very soon. We expect worker’s income and spending, along with corporate investment, to see a lift as this happens. At the same time, government spending is also set to rise which should increase the deficit. The combination of all this comes as the economy is nearing full employment according to most economists. While the surge in stock values from December through January can be largely explained by the tax changes, it also led a significant ramp-up in expectations for interest rates. We saw a marked increase, for example, in rate expectations through January and wrote about that on January 22. Rising rates and higher stock valuations contributed to a market correction at the end of January. Since that break, we are seeing initial positive signs. Some of the rate jitters have abated, stocks have firmed somewhat, volatility has receded, and credit spreads are reasonably well behaved. Still, we are expecting to see some welcome moderation in the pace of equity price gains in the months ahead. We say “welcome” because for gains to be sustained, it is important that price remain rooted in fundamentals. Ultimately, a steadily improving economy over a long period with relatively low inflation is a good recipe for returns. We update our forecast path for our barometer this month (above). 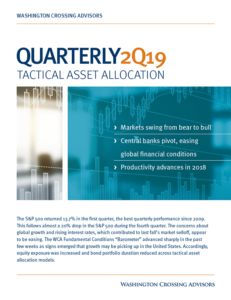 Our near-term growth expectation remains solid, but some settling down seems in order. Expectations appear aligned with improving fundamentals, but valuations also reflect continued non-inflationary growth.